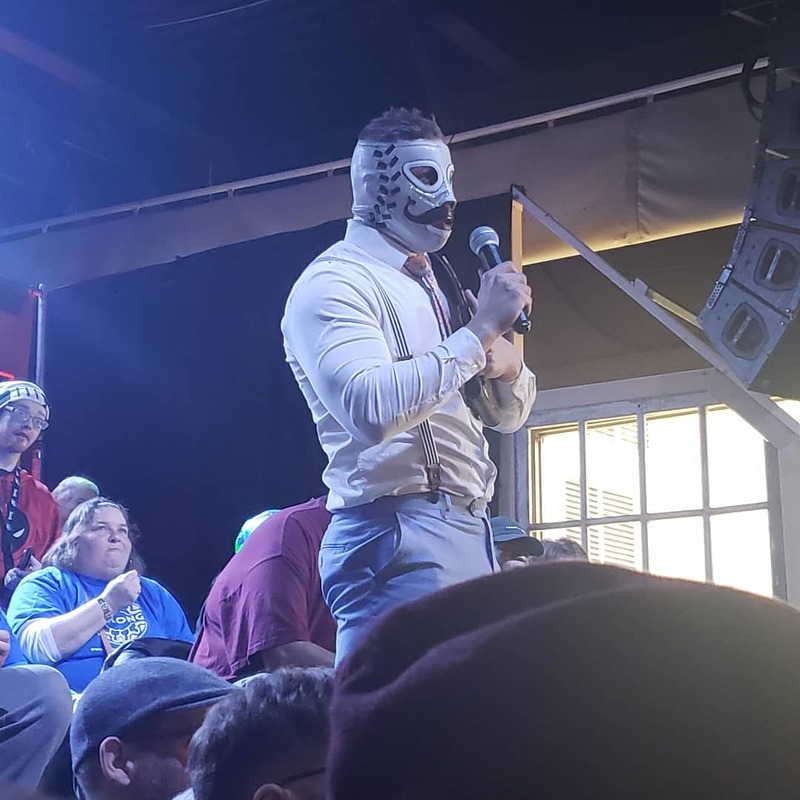 Every year CHIKARA Pro hosts this event. Admission is free, but donations are accepted. All donations from this year went to the Arch Street Center, which assists adults with serious mental illnesses. As with most years, I have gone it was standing room only. The event started shortly after the crowd finished entering the room. Penelope wins with a back handspring Ace Crusher. She then applied lipstick and vandalized Still Life with a kiss on the forehead. Blank, displeased, left the ring shortly after Penelope, leaving Still Life alone. Match 2: The Bird and the Bee (Solo Darling and Willow Nightingale) d. Los Ice Creams (El Hijo del Ice Cream and Ice Cream Junior), The Colony (Green Ant and Thief Ant) and The Proteus Wheel (Frantik and Volgar) in an elimination match. This was the first time I have gotten to see a future guest of our show Frantik, he eliminated The Colony, which included September’s guest Green Ant. The Bird and the Bee now have two points. Match 3: Icarus d. Christian Cobain with a Blu-Ray. This is the first I’ve heard of Christian Cobain he reminded me of a cross between Cobra and Jean-Pierre Lafitte. Match 4: Missile Assault Man d. Juan Francisco de Coronado with a Scorpion Death Drop. Missile Assault Man is one of the most impactful wrestlers I’ve ever seen. After the match Juan received a very upsetting letter, it appears that he has some trouble with taxes in Ecuador. This was my match of the night. Match 5: “Mr. Touchdown”, Mark Angelosetti wants his title back from Dasher Hatfield. He calls him out. Boomer Hatfield makes the mistake of getting involved and narrowly avoids a beat down from Angelosetti. Dasher makes an appearance only to say that “Mr. Touchdown needs to earn the title”, which is lovely since Dasher didn’t earn it at all. This leads to “Mr. Touchdown” vs. Callux of The Proteus Wheel. Of course, Touchdown wins, but that is still not good enough for Dasher. From this point, the match paces have quickened and there is much less storytelling due to time constraints. 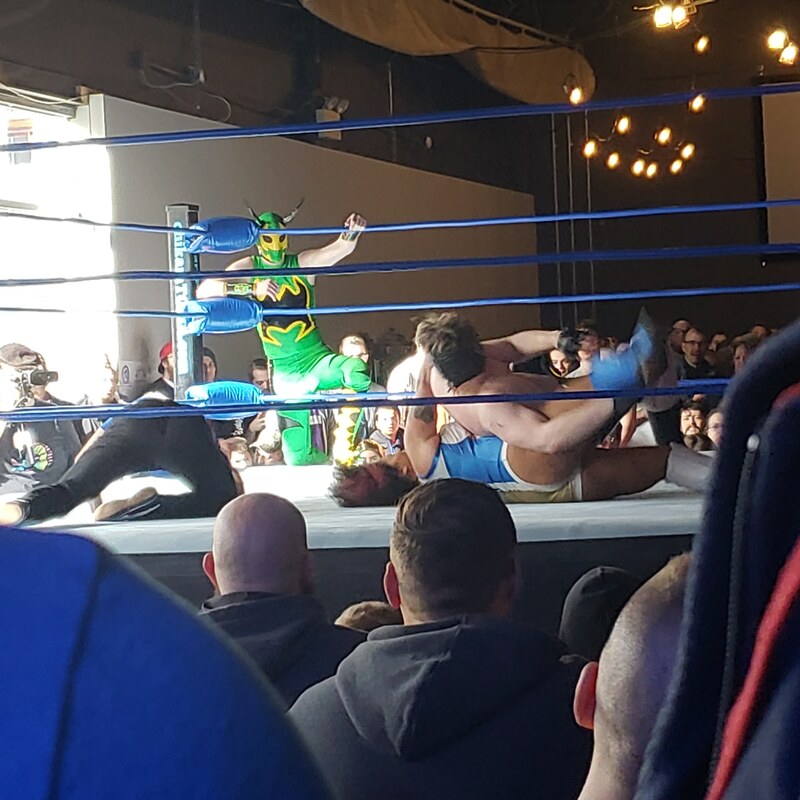 Match 6: The Creatures of the Deep (Oceanea and Merlok) d. Blanche Babish and Jeremy Leary with The Tidal Wave on Leary. 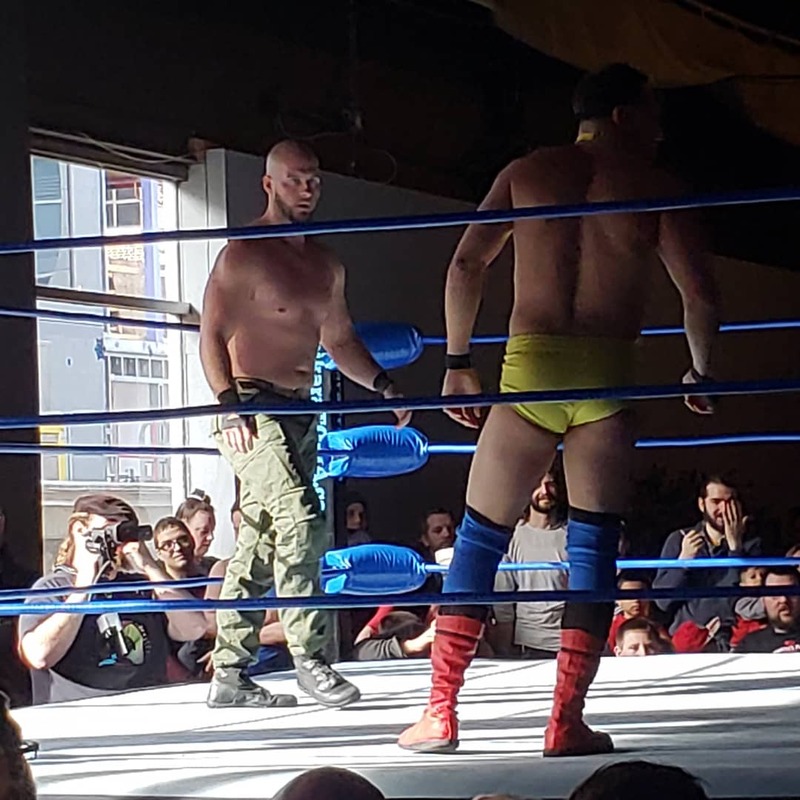 Match 7: Officer Warren Barksdale w/Officer Magnum d. Hallowicked. Surprisingly Barksdale actually gets the win here. Match 8: F.I.S.T. (Travis Huckabee and Tony Deppen) d. Xyberhawx 2000 (Razerhawk and Nytehawk) The Xyberhawx had a great showing, with Razerhawk being the star of this short match up. Match 9: Main Event: Campeonatos De Parejas: The Whisper and Princess Kimberlee d. Crummels & Defarge in a Two Out of Three Falls match. Princess Kimberlee and The Whisper retained, much to the dismay of Princess Kimberlee. 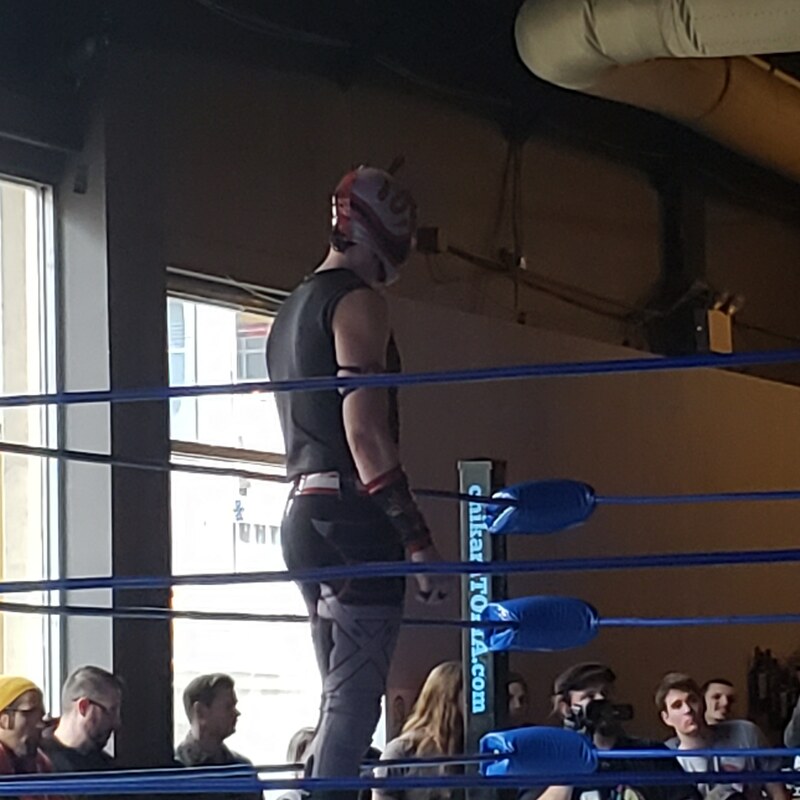 This entry was posted in CHIKARA, CHIKARA, Independent Wrestling, Professional Wrestling, Wrestling and tagged "Mr. Touchdown" Mark Angelosetti, #NPWD, #NPWD2019, 2019, Arch Street Center, Blanch Babish, Blank, Boomer Hatfield, Callux The Castigator, Campeonatos De Parejas, Charity, Chikara, CHIKARA Grand Championship, Christian Cobain, Cornelius Crummels, Creatures of the Deep, Dasher Hatfield, El Hijo del Ice Cream, F.I.S.T., Frantik, Green Ant, Hallowicked, Icarus, Ice Cream Junior, Independent Wrestling, Jeremy Leary, Juan Francisco de Coronado, Los Ice Creams, Merlock, Missile Assault Man, National Pro Wrestling Day, Nytehawk, Oceanea, Officer Magnum, Officer Warren Barksdale, Penelope Ford, Princess Kimberlee, Professional Wrestling, Razerhawk, Solo Darling, Sonny Defarge, Still Life with Apricots and Pears, The Bird and The Bee, The Colony, The Nouveau Aesthetic, The Proteus Wheel, The Whisper, Thief Ant, Tony Deppen, Travis Huckabee, Volgar, Willow Nightingale, Xyberhawx 2000. Bookmark the permalink.